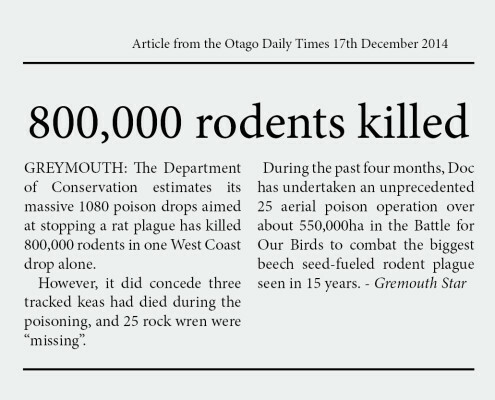 An immediate ban on the aerial use of 1080 poison is needed to prevent more kea deaths. 1. The Kea, the world’s only mountain parrot, needs your help! 2. Why is the NZ Government poisoning Kea? 4. Why is TbFree Poisoning Kea Habitat? Playing with these big parrots, in car parks and at ski fields, is one of the best experiences NZ has to offer animal lovers. But the kea’s home, the alpine herb fields and rainforests of southern NZ, is being poisoned by the New Zealand Government. Cinnamon-flavoured, cereal food pellets will be spread from the air, twice. The first time they will be just flavoured cereal. The second time, they will contain deadly 1080 poison. Kea will eat the cereal baits and die. They will also be poisoned if they drink from ponds and alpine tarns where the baits lie, or scavenge poisoned carcasses or eat the dying insects surrounding the poisonous baits. It was first recognised that the government’s poisonings were killing kea in 1963. In 2008, government monitoring of the kea began. The monitoring showed that large numbers of kea were dying. At one site (North Okarito) 77% of the monitored kea died. 1080 poisoning is very cruel. It causes extreme spasms and vomiting, with suffering for many hours or days. Many kea are likely to die. There are not many kea left. In 1986 and 1992, it was estimated there were 1000-5000 kea, in total. The Government poisonings will not only kill off precious kea. There is solid evidence that the Government’s 1080 poisonings kill many other native creatures and cause plagues of unwanted species. The whole ecology is at stake.